Kevin Hayes scored two goals in his second game at the tournament, and Anders Lee earned the match-winner as the U.S. out shot Russia by 35 to 19. “A great win. We grew as a team today,” forward Johnny Gaudreau said. Nikita Gusev scored on a breakaway with just the Russians’ second shot at 12:29. 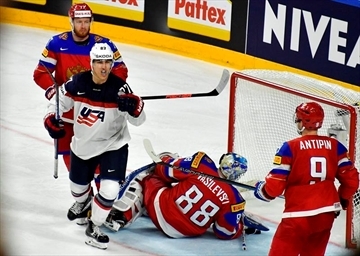 With five penalties in the first period, Russian indiscipline was bailed out by their defence, while the Americans were grateful to goaltender Jimmy Howard for a good save on another Russian breakaway. The U.S. had 16 shots compared to Russia’s three in the first period alone. Kucherov was still off the ice when Hayes equalized at the start of the second on a power play, scoring from a narrow angle. It was Hayes’ first goal since joining the U.S. following the New York Rangers’ elimination from the NHL playoffs. After Marner’s early goal for Canada, center Jani Lajunen equalized for Finland within 18 seconds. But less than one minute later Marner set up Colton Parayko for another laser beam slap shot from the defender. Centre Nate MacKinnon, Canada’s leading scorer with 12 points, set up Marner for 3-1 later in the first period. Brayden Point got a fortuitous fourth after the puck came back off the boards and fell just in front of goal. But defenceman Atte Ohtamaa kept Finland in with an outside chance heading into the third period. The suspense lasted precisely 34 seconds as Finland gave the puck away and centre Matt Duchene peeled away to score. It was a nail-biter in Cologne, where Germany equalized with 33 seconds to go through centre Felix Schutz. Germany broke through with two quick goals midway through the second period with left winger David Wolf netting and veteran defenceman Dennis Seidenberg scoring 27 seconds later.